Yesterday, I started to discuss the role of schools in children’s diets. While we see some wonderful school-based programming such as teaching gardens that promote children’s health, is it up to the schools to direct children’s eating habits? I think getting kids to garden is a great idea, and possibly a way to get kids to eat higher-quality diets. But as schools continue to offer programs such as this, and as schools continue to provide a large percentage of children’s daily diets, how responsible should they really be for their students’ health outcomes and dietary habits? Are we leaving kids’ health up to the schools? Teaching garden programs are popping up across the nation. 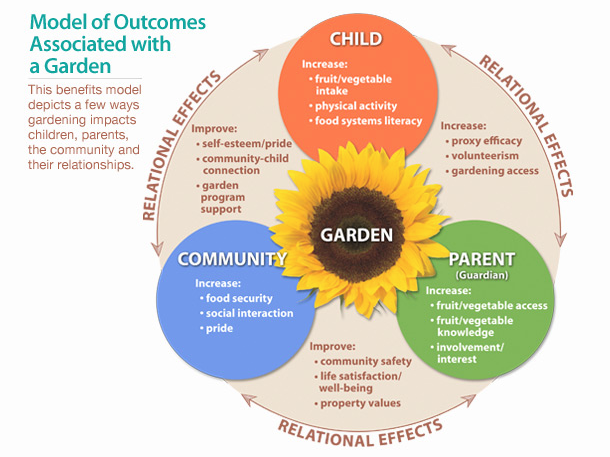 Kidsgardening.org, a useful site for resources on getting kids in the garden at home or at school, notes among the many impacts of these programs that they can improve nutrition attitudes, which potentially lead to better dietary habits. While lots of us may be getting out in gardens more than ever, children’s garden lessons are increasingly occurring during school hours as part of a classroom curriculum. Great! Here is one more way we can try to improve children’s eating habits and address the jaw-dropping rates of childhood overweight and obesity. I am excited to see programs like these – called teaching gardens or simply school gardens – as well as many other school-based interventions, which encourage better eating and activity habits for kids. But are we putting too much pressure on the schools to manage our kids’ health? You might just view the school garden as another great way to get kids outside, but these gardens help tell a bigger story in which schools are becoming increasingly liable for the health of kids. The question becomes: who should be held responsible for kids’ health? I found an interesting article on this topic that presented arguments for both sides. But, on the other end of the debate, others argue the school environment can only go so far in promoting kids’ health. Parents and the community are important resources that need to be held reliable. What’s more, the school can only promote health to the extent that the parents and community will allow and work with the school. The classic example is the parent who wants to bring cupcakes to school. If the school is regarded as the most responsible for children’s health, the parents look bad if their own food choices are not up to snuff with the school standards. Consequently, a parent might be upset about a school controlling their child’s diet. I for one have met parents who are extremely defensive about the idea of the school telling the parent what their child can and cannot eat on school premises. For instance: Who wants to be told they can only pack their child a lunch if the yogurt they pack contains no added sugars? Might there at least be some gray boundaries in terms of what we each consider healthy? What’s more, those who support this latter argument may feel as though they should be able to give their child a treat without being denigrated by the school. So is it the parent, the school or someone else who needs to direct what kids eat? More on this tomorrow…Stay tuned and share your thoughts! Way to go, LA Sprouts!